Wine Bloggers Conferenece Day 3 Recap! What happened? Where did it all go? Damn that flew by. 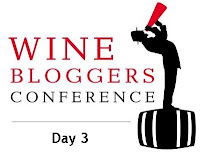 Day 3, the final day of the Wine Bloggers Conference. Am I awake? Well…sort of. I enjoyed a nicely greasy IHOP breakfast with the man himself, Joel Vincent, Megan Wannabe Wino, Dirty South Wine and Doug from Able Grape. Nothing like carbs and sugar to cure a hangover! Err I mean an energy slump. Back at the Flamingo, as tempting as it was to veg by the pool again, I ducked in to the Unconference just in time. The few stragglers that made it to the morning session really deserve extra credit, since it was the end of a pretty intense weekend. Michelle Lentz, my new BFF, led round tables of the hot discussion topics from the WBC. there were mini sessions recapping the breakouts from Saturday, and there were also new topics, such as Twitter / Social Media, Organic Wines, and Most Surprising Thing. I spent a few minutes at the Should Bloggers Post Negative Reviews sessions and heard some interesting feedback in both directions. Personally, I don’t have the time to post about every negative wine that I taste. That said, I will absolutely post something negative if it was really terrible or really surprising, but I do try to have a balanced approach to my blog. However, my blog is about really terrific wines. I don’t write about mediocre wines, or the mass produced wine I had at a friends party. What do you do? Do you post all reviews? Do you post only good reviews? Do you post negative reviews? Vinquiring minds want to know. After that, I found myself being drafted in to the Twitter table. Apparently, I have been nominated Twitter Queen of the WBC. Do I get a crown? Please? I have found Twitter and other social media tools to be very valuable in terms of networking and getting to know more wine bloggers. As both a wine blogger and an employee of a wine related business, it is critical that we find new ways to market and get the word out. Some key points of the Twitter discussion were Twitter social etiquette, introducing new members, getting started, and how to separate your business from your personal Twitter life. One of the most important lessons for Twitterers to understand is that it is a tool. I fyou abuse it, you will be unfollowed. If you are not giving as much as you are getting, then you are not going to be a member of the club for very long. Moral of this speech? Make sure if you meet new wine bloggers, and they are on Twitter already or they are going to get on Tiwtter that you do them the courtesy of announcing them to your followers. This allows them to gain a small following to start with, and they can earn additional followers based on the content they are tweeting. 2004 Medlock Ames Alexander Valley Bell Mtn Cabernet -0 huge classic AV cab. Rich chocolate, cherry, tobacco, earth. Actually had 1/2 a glass of this at lunch. 2006 Flowers Chardonnay – creamy, rich & spicy, lots of oak but citrus burst. 2004 Montemaggiore Dry Creek Valley Syrah – Meaty, black cherry. Cab blend. 2007 Siduri Sonoma Coast Pinot Noir – herbaceous, lighter quality pinot. nice spice and red fruits. After the final lunch, the conference concluded. What a great weekend! I was so happy to meet so many people that I only knew from the Twitterverse. I would like to personally thank everyone involved in making this such a memorable first Wine Bloggers Conference! Pictures and thoughts on the rest of my Sunday wine excursion, after the WBC, will be up next! You too you Dirty Boy! Looking forward to drinking with you at next WBC, if not sooner! Boy- was that IHOP breakfast needed!I'm with you on your negative review stance. Keep the blog balanced, and if it is truly terrible, write about it.Great to meet you at the WBC.